Understanding biodiversity is one of the main goals in primatology. This task is particularly challenging in cryptic species where speciation is not always accompanied by noticeable morphological change. 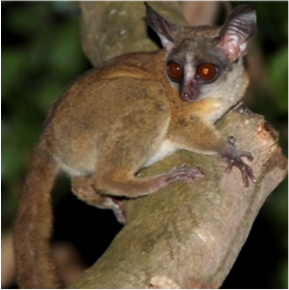 Bushbabies (Galagidae) are among the most morphologically cryptic of all primates and their systematics is one of the most longstanding problems in primatology. Given the lack of morphological differentiation, galagid species have been mostly described based on their vocal behavior. Advertisement calls have been suggested to play a critical role in reproductive isolation, however the lack of genetic data does not allow researchers to test whether specific differences in vocal signals represent an efficient premating isolation mechanism contributing to species cohesiveness. During my PhD thesis I have combined genetic, morphological, and acoustic data to explore species boundaries in one of the most cryptic complexes of primates, the dwarf galagos (genus Galagoides). Future studies are aimed to further explore species boundaries and speciation mechanisms in cryptic primates by combining species distribution models and novel genomic techniques (e.g., RAD-seq).